Lew Church | 12/6/2017, 9:35 a.m. 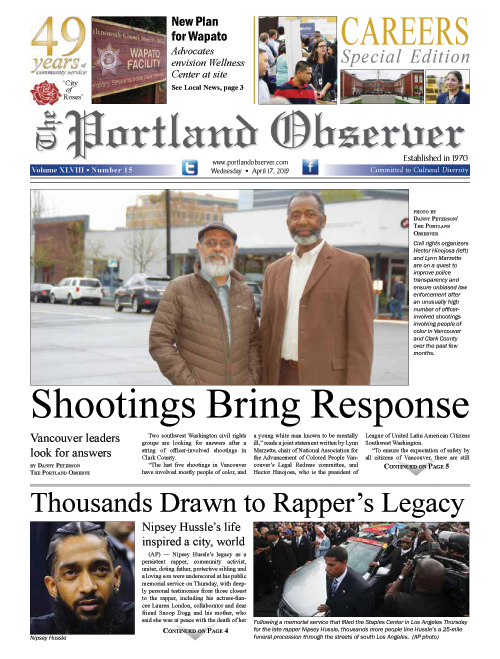 The excellent editorial cartoon and commentary about gun control (Preventing Gun Deaths and Protecting Gun Rights, Portland Observer, Nov. 15 issue) highlights the need to not lose heart when advocating for what the mainstream media tends to characterize as "impossible" goals. At Portland State, our activist coalition has been discussing strategy and tactics with this in mind for three issues: Rent control, gun control and impeachment. We believe each of these is vital, and more importantly, achievable sooner, not later. The Italian Marxist organizer Antonio Gramsci once said, "The challenge for modernity is to live life without illusions and without becoming disillusioned." In terms of political issues in which the powers that be insist "will never change," we at PSU have found it useful to ask, what would Nelson Mandela do? I was one of the organizers of five pickets in Portland in support of the American Friends Service Committee’s anti-apartheid Coke boycott, before the white minority, racist government was overthrown in Pretoria. Some of us at PSU (now elders) believed that when the suffragette movement, and when the anti-slavery movement initially got started, the powers that be (usually white male capitalists and their media brethren) would insist in the UK, for example, that to abolish slavery would be to destroy the jobs of thousands of UK workers, dependent on the slave trade for their industrial output and paychecks. Likewise, suffragettes and anti-apartheid activists later on were told by those in power that giving the vote to women and black folk would destroy the smarter, more accomplished white male power structure that creates wealth for lesser folks. Today, when it comes to the issues of rent control, gun control and impeaching Trump -- activists hear doomsday scenarios from those with something to lose by such changes. In Oregon, rent control was blocked in Salem earlier this year by a blue dog Democrat and landlord state senator, Rod Monroe. "Rent raisin'" Rod is now being challenged by two Democrats in the May Primary. Portland Gray Panthers, based at PSU, is happy to endorse Kayse Jama of Unite Oregon to replace Monroe. The incumbent would be wise to follow the example set by Portland City Council member (and millionaire) Dan Saltzman -- by simply announcing he is retiring, Let Jama go to work for tenants, for immigrants, for people of color, for workers and the poor in our state capital. In terms of gun control, I was able to write a funded grant (generously supported by the northwest's McKenzie River Gathering) for a pro-gun control conference at PSU. I believe that Australia and European countries have acted to stop gun violence. As we know, the NRA, the Republicans and Trump -- are refusing to do so. Do we think housing and public safety (freedom from gun violence) are important enough issues to launch grassroots, mass movements, like the anti-apartheid, anti-slavery and pro-suffrage movements? Does the success of those decades-long organizing movements give hope (rather than despair?) to those of us who believe that rent control and gun control alike are sorely needed today? Do We Need a City-Wide Rent Strike?